Candid community photos - Click Here! Square Footage: 1103 sq. ft. - 1,560 sq. ft.
One of the things we like best is how walkable Ladera Vista is. Just outside the gated entrance to the north is a Safeway grocery store, Starbucks, CVS Pharmacy, Panda Express, Jack In The Box, Chase Bank and anything else most would need for everyday necessities. A bus stop is located 1/4 mile to the west. As far as nearby amenities go, the list is endless. Costco, Sam's Club, Target, Walmart, Home Depot, Lowes, movie theaters, health clubs, West World, hospitals, Spring Training, parks, hiking, golf, Kierland Commons, Desert Ridge, Scottsdale Quarter... Literally, we could write about things to do, restaurants and places to shop for hours. In other words - the location is amazing and an excellent choice for a primary residence, vacation home, or rental property. 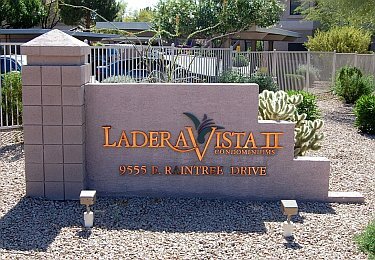 Some of the condos on the east side of the community have views of the McDowell Mountains, while others have pool views, or simple common area views. Towne Development did a nice job of landscaping with fountains, a wide variety of trees, shrubs and some grass to keep things interesting. Units located to the north and west are prone to some traffic noise from Raintree and 94th St. There's no fitness center located on-site, but Gold's Gym is less than 2 miles away.